We chose a plum colored for our room. The trim is a creamy white color. The fan was bought for $10 on Craigslist. The wallpaper was peeling and the paint job looked like it had been done by 10 year olds. We chose a warm taupe color. The fan is also another Craigslist find. This one was $20. The paint is Home Depot Behr Premium Plus. This room needed 2 coats because it was drying not opaque enough. The color in this room wasn't too bad, it was more of the bad paint job. 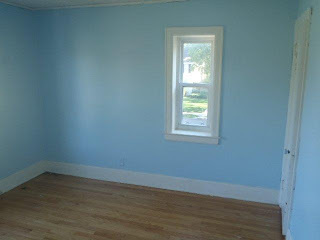 The last owners did not use a drop cloth and got paint ALL OVER the floor. Also, they didn't use tape so there is brown paint from the previous paint job and the white trim was painted blue. We went with a spring green color called Apple 3. It is not quite as bright as it appears in this picture. looking good :) Great makeover!!! Great color choices!! Thanks for the update! Looking great! I love the color for your office!! It really is coming along beautifully! Thank you! I believe it is called taupe 4 which is a Valspar paint but we got the color matched to a Behr paint since we like the quality better.